Thornton Wilder once said: "Money is like manure; it's not worth a thing unless it's spread around encouraging young things to grow." Through the Eyes Of Hope Project (TEOH) is this quote in action. This non-profit organization based in Rwanda, encourages Rwandan orphans to photograph the world through their eyes. They provide them with photography classes and encourage their creativity by exhibiting their work in different venues throughout the world. This December it's New York's turn. The exhibit is being held through the end of the year at Bourbon Coffee, a Rwandan owned coffee shop which has been dubbed the Rwandan Starbucks. The show features the children's newest work. What a great opportunity for New Yorkers to get involved. While you get your caffeine fix, help a child pay for school and get adequate food. 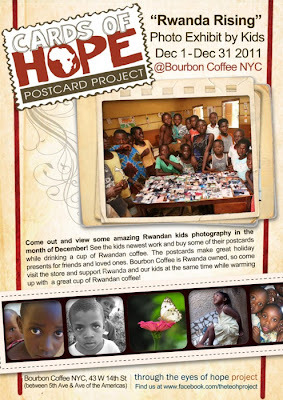 All proceeds from the photos on display at Bourbon Coffee will benefit the TEOH Project. Since the project was started, over $5000 was raised to build a photo studio for the kids in Rwanda. This is more than a charity, it is a social enterprise that let's these children help themselves by empowering them through the art of photography. Postcards and photos can be purchased at the show. They will make the perfect gift for anyone on your list! This Christmas help a young thing grow!